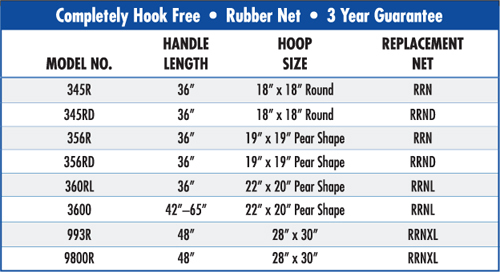 • High quality thermal plastic-rubber nets will not snag hooks or fish. • No untangling! 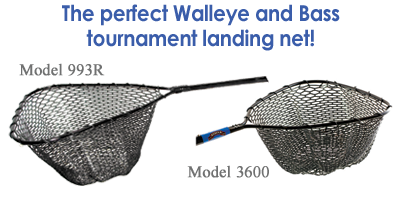 Terrific for Walleye and Bass tournaments. • Model 3600 features telescopic octagonal 1-1/8″ black anodized handle with black hoop. • Automatic push-button alignment for length adjustment. • All 345, 356 and 360 models have 1″ round diamond-embossed aluminum handles with sturdy 1/2″ hoop. Three year guarantee. • Model 993R features a 1-1/4″ fiberglass handle. • Model 9800R features a 1-1/4″ octagon handle. Both have a 5/8″ reinforced hoop. • Two-piece telescopic handle available. • Black anodized hoop and handle – add “B” after model number when ordering. 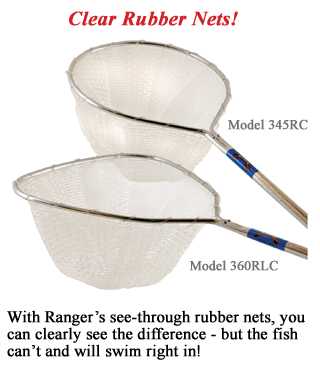 • Clear nets are available. Add “C” after model number when ordering.